A new report from analysts at Wireless Intelligence shows that Apple’s iPhone (s AAPL) is continuing to gain market share in U.S. smartphones sales. The report, issued Thursday, looks at sales information reported by the largest U.S. carriers and determined that during the first three months of 2012, Verizon (s VZ)(s vod), AT&T (s T) and Sprint (s S) collectively sold 9 million iPhones. Altogether, those same three carriers sold 13.5 million smartphones, which means that for every three smartphones they sold, two of them were iPhones. These figures don’t match up with a recent survey done by NPD that shows Android smartphones account for about 61 percent of all smartphones in the U.S while iPhones account for 29 percent. But they do match up with what carriers reported earlier this quarter. AT&T is riding the iPhone wave specifically when it comes to smartphones sales — 4.3 million of the 5.5 million smartphones it sold during the first quarter of the year were made by Apple. Verizon reported somewhat lower numbers: 3.2 million iPhones, but that was about half of all of its smartphone sales for the quarter. Sprint, the newest iPhone carrier in the U.S. sold 1.5 million iPhones, which was about 76 percent of all smartphones during the quarter, according to Wireless Intelligence. For all three of these operators, their number of iPhone sales are lower in the first three months of 2012 than they were in the last three months of 2011. The fourth quarter of 2011 was notable though because it included both the launch of the iPhone 4S as well as the holiday shopping period. So while overall numbers of iPhones weren’t as high for the first quarter as they were for the last, these numbers show that the iPhone is still the most important device that these carriers are selling when it comes to retaining and recruiting customers. please please please do some critical thinking and review before you continue to perpetuate a 2 bit research house’s bid to release anything ridiculous to get into the news. the wildly oxymoronic Wireless Intelligence mixes two very different numbers. Let’s take AT&T’s numbers as an example. 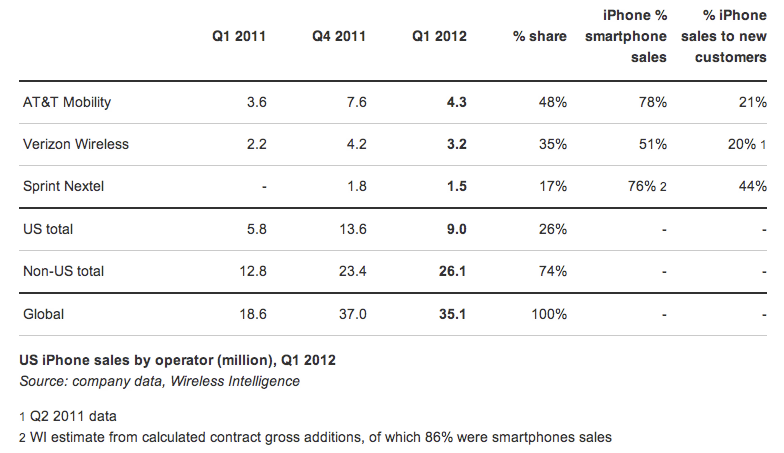 AT&T SOLD 5.5M smartphones in the last quarter. AT&T ACTIVATED 4.3 iPhones in the same quarter. These are numbers taken directly out of AT&T’s quarterly earnings statements. 4.3M/5.5M = 78% right? So what’s the problem then? Glad you asked. The problem is that units sold do not equal activations. activations are from all sources…with the largest being folks that buy directly from apple…which i’m sure there are plenty of. plus best buy, walmart, amazon, ebay…well, you get it. obviously there will be more activations by AT&T then units sold by AT&T. iPhone HARDLY has 78% of the smartphone sales at AT&T…Wireless Intelligence should refund all their clients for such shoddy analysis. If you own a smartphone, and the screen is broken, or your iPhone 4 or 4S is broken, then check out http://www.sendtofix.com to get your device FIXED! T-Mobile desperately needs to be in the iPhone game.